The use of white distilled vinegar for cleaning hair clippers is an old age practice. The fundamental purpose for its use is because of its acidity. White distilled vinegar is an acidic solution that is formulated through fermentation. An acidic solution is effective against bacteria and mold. The main reason for the widely accepted use of this acidic solution is because, unlike others, it is safe to be used around kids and pets. White distilled vinegar is a natural cleaning product that has found its use in several applications. Another reason for it being a preferred solution by many is because it is not so hard to come by and it is inexpensive. 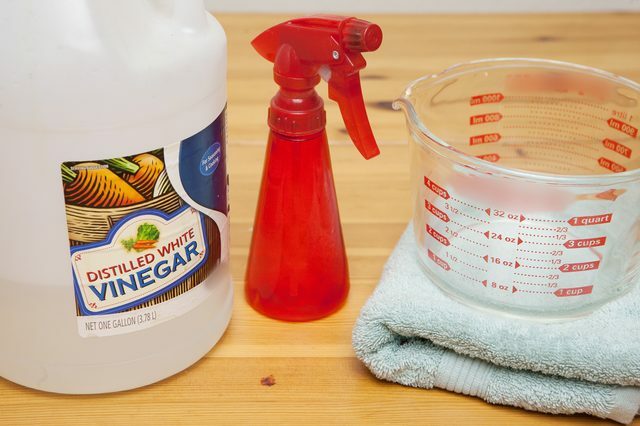 If you have white distilled vinegar at home or can easily have access to it, here is how to clean your hair clippers with this acidic solution. This is the first most important thing to do. You have to ensure that the hair clipper is not only switched off, it has to be disconnected from the power source. In other words, if you are using an electrically powered hair clipper, unplug its power cord from the power source. If you have a battery powered hair clipper, remove the batteries. Once the hair clipper has been disconnected from the power source, place the clipper over a waste bin. Try and get as much visible hair on the hair clipper off. To avoid the stress of re-cleaning, it is best you keep the keeping over the waste bin all through the time you are removing the hair particles. You can apply a little pressure in the form of a bump to also aid in removing as much hair as possible. If there are still some hairs lodged in between the blades, you may have to unscrew and separate the blades. That is the only way for you to get proper access to remove the dirt and hair debris. For those hiding in between the blade teeth, you can get a wire or anything material to carefully remove what is left in the blade. Apart from the separation of the blades, you would need to get rid of the attached accessories. Anything from blades to foils can act as a crevice for hair particles to hide. At this stage, you can prepare the white distilled vinegar by turning the solution into a small container. Use a container that you know would comfortably hold the entire accessories and parts you wish to clean. Get the accessories and parts that you want to clean and soak them in the container containing the white distilled vinegar. Allow them to soak for a while as the acidic solution kills off all bacteria and mold organisms hiding in the hair clipper. The use of white distilled vinegar for cleaning and treating hair clippers should not be done daily. A certain amount of time, maybe two to three times, in a month is ideal, depending on the frequency of use. As earlier stated, white distilled vinegar is a natural option to getting your hair clipper cleaned. The usefulness and service life of a hair clipper is largely determined by the nature and frequency of maintenance it received. With the many reported effects of using chemicals as disinfectants and cleaning agents, white distilled vinegar stands as a better alternative. It is easy to use and would have no harmful effect on pets and on little children. By following the aforementioned steps, anyone with white distilled vinegar at home can clean and disinfect their hair clippers all by themselves.